Directions: Click here for map/directions. I offer nutrition counseling services for a variety of nutrition related problems. I practice in a holistic way, which means that we will discuss how all aspects of your life influence your eating and activity patterns. Hilary Warner of Nutrition Works! LLC is a registered and licensed dietitian and nutritionist offering one-on-one nutrition counseling, dietary coaching, personalized nutrition plans, fitness plans and overall wellness consultations in Concord New Hampshire. 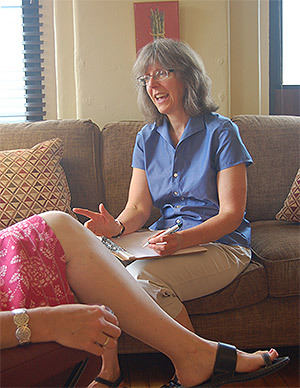 Hilary Warner has advanced training in the treatment of eating disorders such as anorexia and bulimia. As a registered nutritionist/dietitian, she helps people lower blood pressure and lower cholesterol, and counsels individuals how to improve their diet to manage gluten intolerance, celiac disease, irritable bowel disease, and other food-related health problems. If your child is overweight, Hilary can coach parents and children on how to build a healthy body with good nutrition and regular activity. Hilary Warner can help you if you want to lose weight consistently, improve your general eating habits, learn how to cook healthy meals, improve your sports performance, and get healthier through good diet! Nutrition Works! LLC is located in Concord, NH and provides nutrition counseling to individuals throughout the state of New Hampshire.